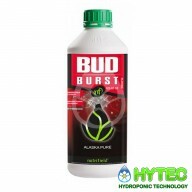 Here at Hytec Horticulture we provide a large selection of Bloom Boosters, stocking top brands such as Canna, Vitalink, Nutrifield, Advanced Nutrients and Foxfarm plus many more. Making the most out of your crop is important so we make sure we have in store quality Bloom boosters and Bio Stimulants for the gardener who wants a bigger and better yield. 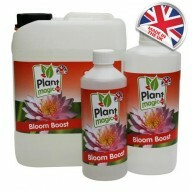 Plant Magic Plus Bloom Boost is a PK 13/14 booster used to enhance your yields during the flowering phase. 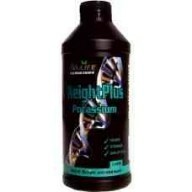 Plant Magic Plus Bloom Boost is unique in that it also contains some elements of Nitrogen to maintain a balanced nutrient (NPK) profile. 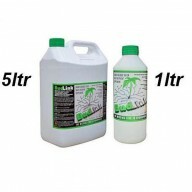 Bloom Boost contains high levels of phosphorous and pota.. Growers Ark Boost IT! 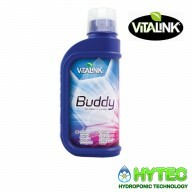 Growers ark Boost IT! is a PK 13/14 booster for fast growing fruiting & flowering crops, Utilising Nh4 nitrogen to maintain a balanced nutrient profile .. 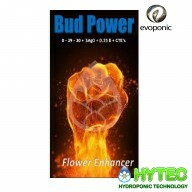 BUD POWER-EVOPONIC Bud Power will boost flower development increasing yield and fruit flavour without decreasing mineral elements from the growing medium. 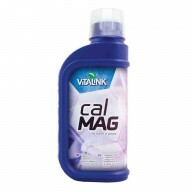 The Magnesium and Boron will support a robust, healthy plant during the rapid development of fruits and flowers. Typical Analysis: .. 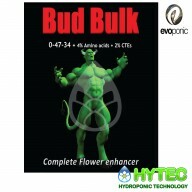 BUD BULK-EVOPONIC Complete flower enhancer Bud Bulk is a complete flower enhancer to be used from after the second week of flowering. 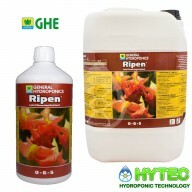 It is rich in Amino acids and growth intermediates to promote big flowers and fruiting. 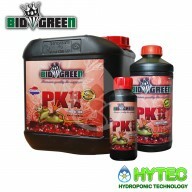 Bud Bulk is the ideal partner to standard flowering nurtition for the adv..
BIOGREEN PK 13-14 PK 13-14 is a high-quality fertilizer containing all macro- and micro-nutrients necessary to strengthen the formation of blooms in any medium. Benefits Sufficient Potassium to give the bloom an additional impetus Sufficient Phosphorus for an optimal bloom formation .. 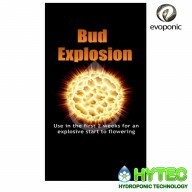 BUD EXPLOSION Evoponic ‘BUD EXPLOSION’ should be used in the first two weeks of flowering and it will release your plants flowering potential. 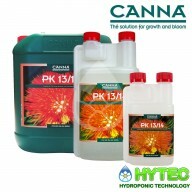 Your plant will begin to flower faster and with extra budding sites. 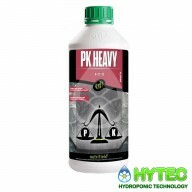 This will enable your plant to achieve higher yields and in some cases, a shorter f..
Potassium Enhancer Weight Plus potassium is a highly concentrated form of Potassium and Phosphorous which, when added to the nutrient solution in the bloom phase of plants, allows for luxury uptake of weight producing potassium. 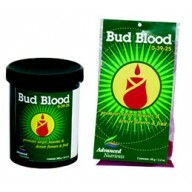 Potassium is used by the plant in a great..
Advanced Nutrients Bud Blood + HERE'S HOW YOU CAN SAVE TIME AND MONEY WHILE GETTING MORE VALUE FROM EVERY HARVEST BY FORCING YOUR CROPS TO BLOOM FASTER AND GIVE YOU BIGGER, BETTER, AND HEAVIER BUDS IN WAY LESS TIME! 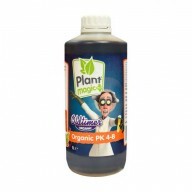 If you are a grower of high value plants and you want to save your..
OLDTIMER ORGANIC PK 4-8 Plant Magic Oldtimer organic PK 4-8 brand new, naturally enhanced organic PK boost will increase fruiting and flowering. 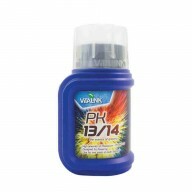 Benefits from Oldtimer organic PK 4-8 include; • Increased yields • Vital phosphorous for plant energy .. 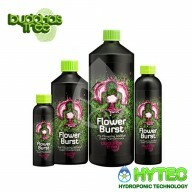 FLOWER BURST BUDDHAS TREE Flower Burst is a unique new product from Buddhas Tree that has been specifically created for use during your plants pre-flowering and early flowering stage. 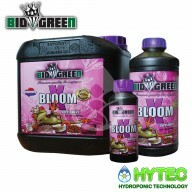 It promotes explosive flower set without hindering continuing vegetive growth, creates an increased number of flo..
BIOGREEN X-BLOOM X-bloom is a high quality supplement that contains all the amino acids and vitamins necessary for an explosive yield in any medium. Benefits Stimulates an explosive top formation Stimulates the production of ATP Increases resistance to diseases Increase.. 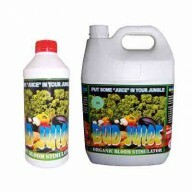 BUD JUICE 1LTR PUT SOME "JUICE" IN YOUR JUNGLE!! 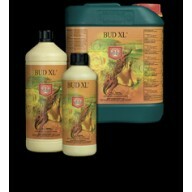 Bud Juice is a blend of natural micro nutrient enzyme activators and naturally occurring plant growth regulators that will; - Trigger flower production - Increase flower sites - Increase essential oil production - Enhance yield up to 40% ..
HOUSE & GARDEN BUD XL 500ml BUD XL 500ml Maximize fruiting potential Bud XL’s enzymes extract sugars from the leaves and carry them to the flowers and fruit. 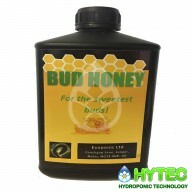 This encourages plants to produce terpenes which sweeten aroma and flavour naturally. The sugars also provide e..